What can I say about this amazing team? In three short years, Diane & Shuttle have gone from casual students, with a goal of a single Junior Hunter title to a dynamo pair that completed their final Master legs during the spring hunt test season. 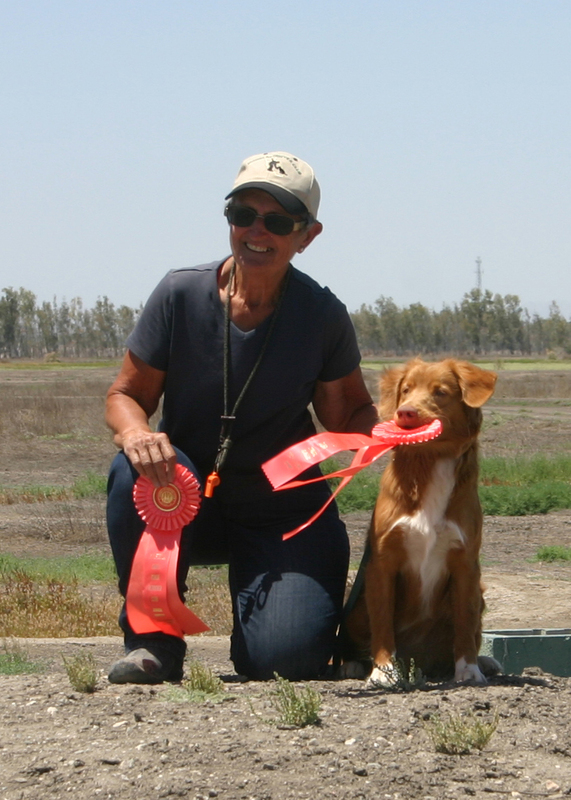 Shuttle & Diane earned legs at the Monterey Bay HRC Spring Hunt Test, the Hills Ferry HRC Hunt Test & the Sierra Nevada Retriever Club Spring Hunt Test. This team is still turning heads. Gustav picked up his last two Senior Hunter legs shortly before his third birthday. Judges at the Monterey Bay HRC Hunt Test & the Hills Ferry Hunt Test couldn’t get over the speed with which Gustav left the line, and his stylish water entries. David & Gustav are now training for Master, and hope to be ready to run in the fall. David learned a lot training Gustav (his first field dog), and his it’s evident that David and Anton will go far. Anton showed David just how much he likes this game by passing four straight Junior Hunter tests, earning his Junior title at just a bit past his first birthday. Anton & David earned JH legs at the Monterey Bay HRC Hunt Test, the Hills Ferry HRC Hunt test, and the Marin Retriever Club’s double-header. Way to go, guys. See you soon in Senior! Not to be outdone by brother Anton, Delilah earned her last three Junior legs and then one more, completing her Junior title the same weekend that Anton earned his. She earned legs at the NorCal Golden Retriever Hunt Test, the Lassen Retriever Club Hunt test, and two legs at the Marin Retriever Club’s double header. Xan must be very proud of Delilah’s performance. She’s certainly a carbon copy of her mother, Layla. We look forward to hearing great things about Delilah’s successes in the field and the show-ring. This girl likes her phessies! This team’s training and talent showed through! New to the game last year, Zeke & Jill had to wait until the spring hunt test season to pick up their final two JH legs. 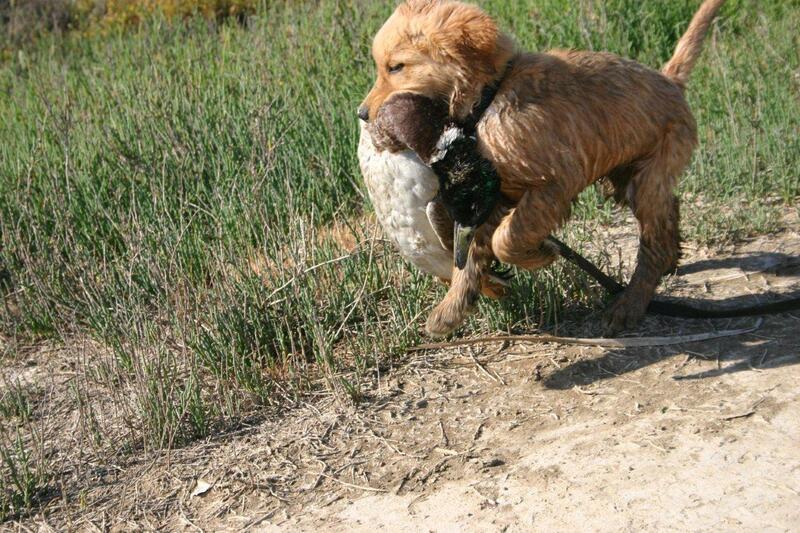 This stylish youngster earned legs at the Monterey Bay HRC Hunt Test and the NorCal Golden Retriever Hunt Test. He really loves this game, and we look forward to seeing them in group, preparing for Senior! Suzanne & Jade have made great strides in a very short time. Jade showed great promise during her puppy evaluations, and under Suzanne’s guidance, has proven that she has a great future ahead of her. 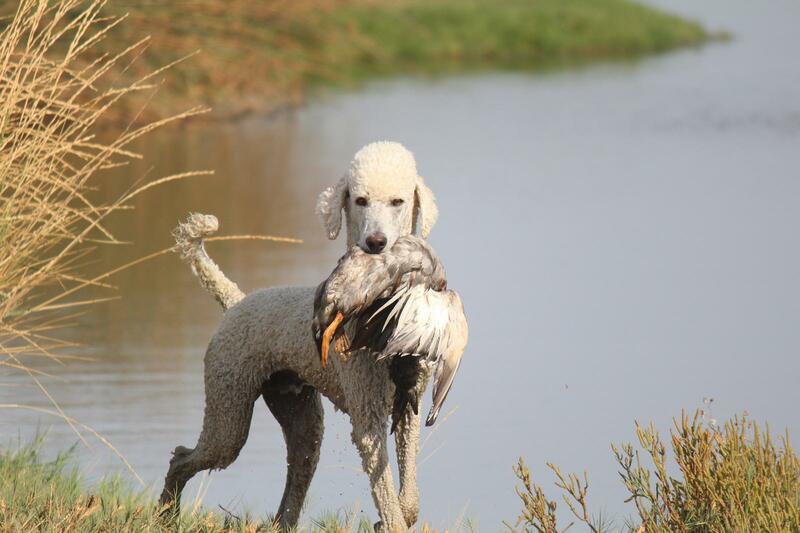 In less than two short months, puppy Jade earned five Junior Hunter legs, giving her one more than necessary to earn her JH. Way to go, team! We’ll look for you in Senior! This team had to wait until the spring hunt test season for an opportunity to earn their fourth Junior Hunter leg. Decker & Jeanne did that easily at the Monterey Bay HRC Hunt Test. But wait, there’s more. Not satisfied waiting until the fall tests to make their debut in Senior, Jeanne & Decker made the trek to the Umpqua Valley Retriever Club double header, and earned two Senior legs. It’s been great watching the teamwork develop between these two. Those last two SH legs should present no difficulties. 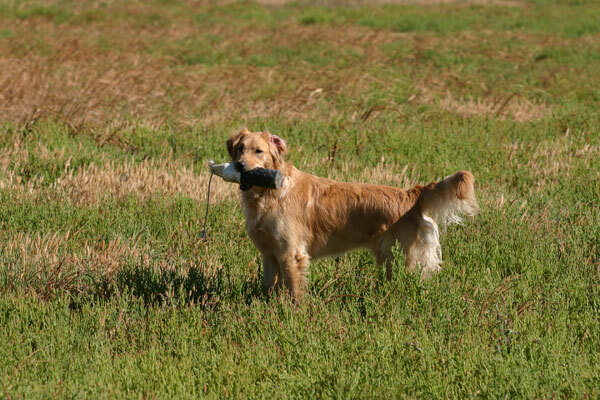 After spending the fall and winter hunting pheasants and ducks, Punch & Shari returned to formal field training in order to prepare for the NorCal Golden Retriever Club’s Working Certificate test. When test day arrived, Punch showed everyone that although he’d taken a few months off of training, his marking skills were still as sharp as ever. He even remembered where the fall of his “no bird” had been, and checked to see if he could convert his land double to a triple. 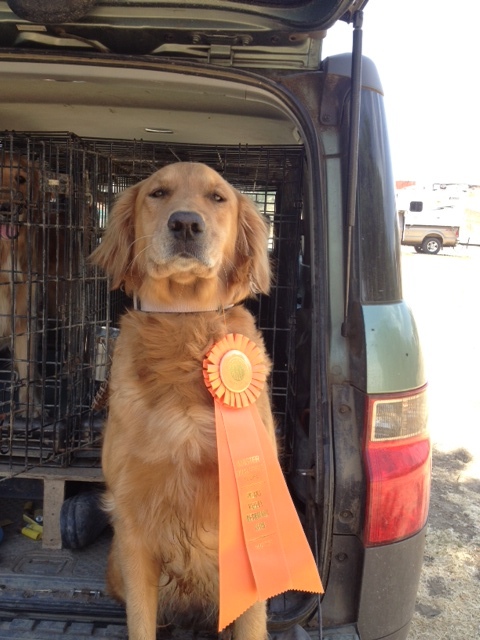 Punch & Shari also earned a second Junior Hunter leg at the NorCal Golden Retriever Club Hunt Test in March. It’s so much fun to watch this little girl work. If you blinked, you might have missed Monkey pursuing her Junior Hunter Title. Five tests, five passes, and a Working Certificate & Working Certificate Excellent in one season. She & Cheryl are just getting started. Monkey earned Junior Hunter legs at the Monterey Bay HRC test, the Hills Ferry HRC test, the NorCal Golden Retriever Club test, and two legs at the Marin Retriever Club double-header. She finished up by bringing home both the WC & the WCX rosette from the NorCal GRC WC/X tests. Cheryl must be so proud of the achievements of her 2008 litters. Not to be outdone by his sisters, Quinn, along with Jeanne earned five Junior Hunter legs and a Working Certificate this season. And he looked great while earning them. This handsome lad earned Junior Hunter legs at the Monterey Bay HRC Hunt Test, the Hills Ferry HRC Hunt Test, the NorCal Golden Retriever Club test, and two legs at the Marin Retriever Club double-header. He also brought home one of those lovely NorCal GRC Working Certificate rosettes. Rainbow and Charlotte are becoming a wonderful team, and will go far together. They went four-for-four for their Junior Hunter Title. Last year, Rainbow earned two Junior Hunter legs in one weekend. This season, she earned her third and fourth on consecutive weekends. Rainbow & Charlotte then went on to earn a Working Certificate AND a Working Certificate Excellent on the same day. We expect the same quick results when they are ready to run in Senior Hunter tests. Cal & Tracey took time out of their busy agility schedule to attend the NorCal Golden Retriever Club’s Working Certificate test, and once again, Cal showed that he can play the field game just as well as the agility game. They are honing their handling skills, and we expect that Cal will be sporting another field title in short order. Congratulations to Lucy & Paddy on the first of many titles that are sure to come their way! 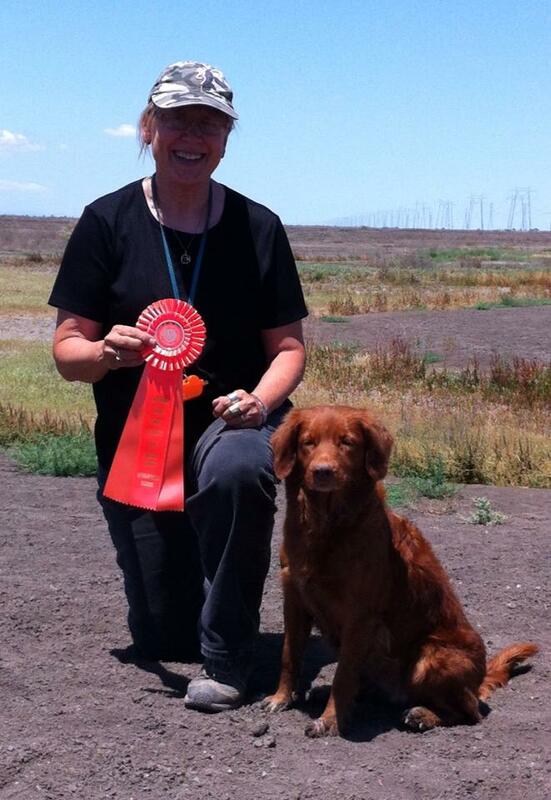 Lucy earned her first title and first Rosette at the NorCal Golden Retriever Club’s Working Certificate Test. And she showed everyone that Poodles are stylish retrievers, not just pretty faces. We’ll look to see Lucy & Paddy competing in Junior Hunter tests soon. What a pleasure it has been to watch Sophie & Harvey work toward their first field title. Harvey took the winter off, and it was wonderful to get to watch the celebration when Sophie picked up her fourth Junior Hunter leg at the Hills Ferry HRC Hunt Test. Harvey and Pam had huge smiles as Sophie delivered her fourth bird of the day to hand. Congratulations! 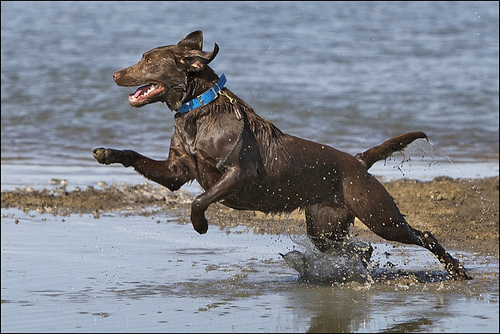 Pam had good reason to smile at the NorCal Golden Retriever Club Hunt Test. Her father’s dog Sophie earned her JH title, and Pam’s Joe wanted to bring home one of those cool rosettes, and a Junior Hunter title, too. And that’s just what he did. Joe and Pam have become a great working team, and we look forward to seeing them compete in higher levels soon. There’s something about watching liver flatcoats in the field. Oliver & Pam had a large group of supporters in the gallery when they earned their fourth Junior Hunter leg at the Marin Retriever Club Hunt Test. That brown dog knew he had done something special for Pam, because Pam had a huge grin on her face. Ollie had picked up legs two and three earlier in the spring at the NorCal GRC Hunt Test and the Monterey Bay HRC Hunt Test. “Ember”is Jean Mott’s Flyer’s daughter, and she is displaying the same talent for the field as mother. At the age of 10 months, Ember & Jean earned a Working Certificate from the Golden Retriever Club of America held by the Norcal Golden Retriever Club in June 2009. Joe & his wife Patti spent their vacation on Vancouver Island, BC, attending the Flat-coated Retriever Society of Canada’s national specialty, where Zip(!!!) & Joe spent a very productive two days running the Pacific Rim Hunting Retriever Club’s Working Certificate and the FCRSC’s WCI test. They passed both tests, and Zip(!!!) also qualified for a FCRSC “Beauty & Brains” award, since he placed third in the FCRSC Specialty Bred-by class. Blaze bounced back from maternity leave in grand fashion, picking up two Master Hunter legs at the Monterey Bay HRC Hunt Test and the Marin Retriever Club Hunt Test, which completed her Master Hunter Title. 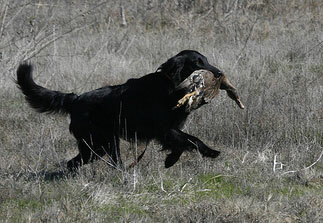 She also earned a Judges Award of Merit at the Sacramento Valley Retriever Club’s Spring Field Trial. Gabby was getting used to being the star career girl while the other two girls finished their motherly duties and got back into shape. So she was horrified when Blaze got herself a Field Trial Qualifying JAM. Well if Blaze could get something that pleased Cheryl so much, Gabby was going to get one too. 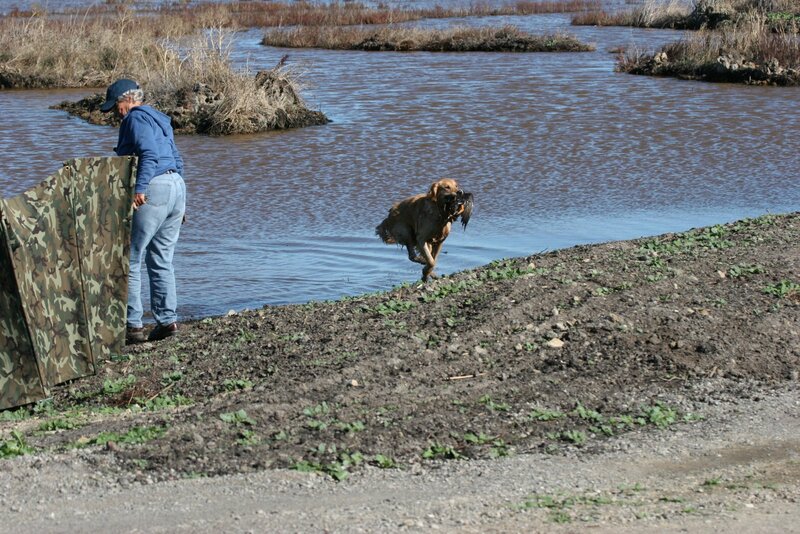 And she did just that at the Sierra Nevada Retriever Club’s Spring Field Trial. Now this just wouldn’t do. Keltie was not going to be the only adult golden in the family without one of those fancy rosettes with the JAM printed on it. So she set off to get one. But before she did that, Keltie & Cheryl earned their last two Master Hunter legs at the Monterey Bay HRC Hunt Test & the Hills Ferry HRC Hunt Test, earning Keltie’s MH. Then, Keltie went hunting for her JAM and found it at the San Jose Retriever Club’s Triple DQ. 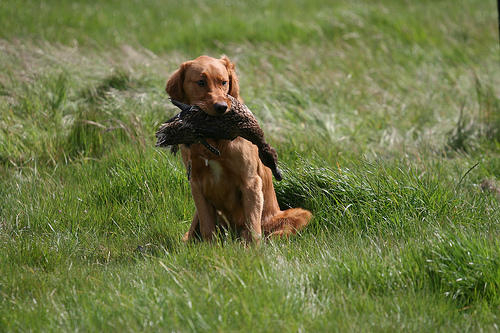 Not being one to be satisfied with that task, she earned another Master Hunter pass at the Marin Retriever Club Hunt Test. This pair is on a roll! Four Master Hunter passes in a row, and they show no sign of slowing down. Zinger & Jean earned MH passes at the NorCal Golden Retriever Club Hunt Test, the Lassen Retriever Club Hunt Test, and at back-to-back tests held by the Sierra Nevada Retriever Club! Congratulations Jean & Zinger! Zinger has also qualified for the Master National. This is her 3rd time qualifying and she has a total of 23 Master passes. This girl finished her Master Hunter title last year, and has three MH passes s0 far this year. Flyer has qualified for the Master National this year. 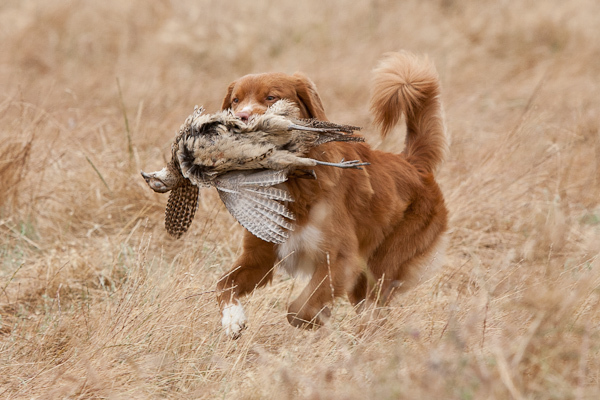 Flyer earned a Master Hunter rosette at the NorCal Golden Retriever Club Hunt Test, and TWO rosettes at the Sierra Nevada Retriever Club’s back-to-back tests. They’re half-way there! 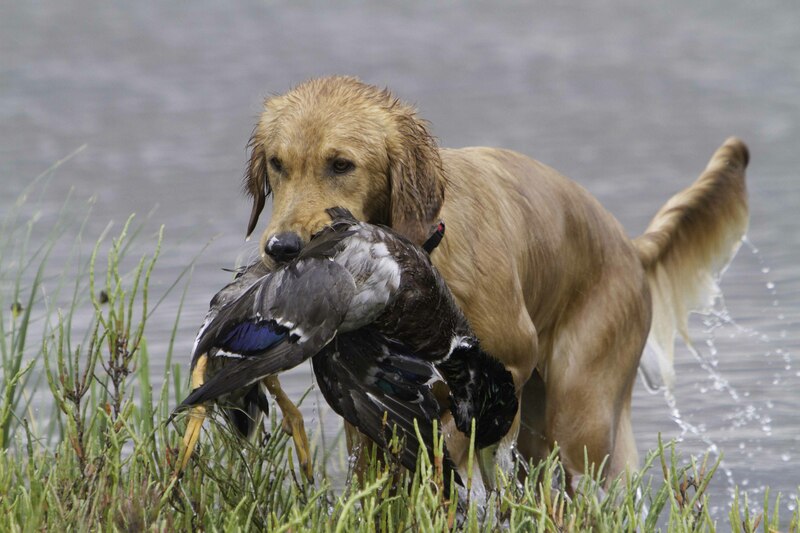 Henley has figured out the handling game, and earned two Senior Hunter legs this spring – one at the NorCal Golden Retriever Club Hunt Test, and the other at the Marin Retriever Club double-header. Congratulations, Ardith. We look forward to watching the two of you earn that Senior Hunter title in the fall tests. 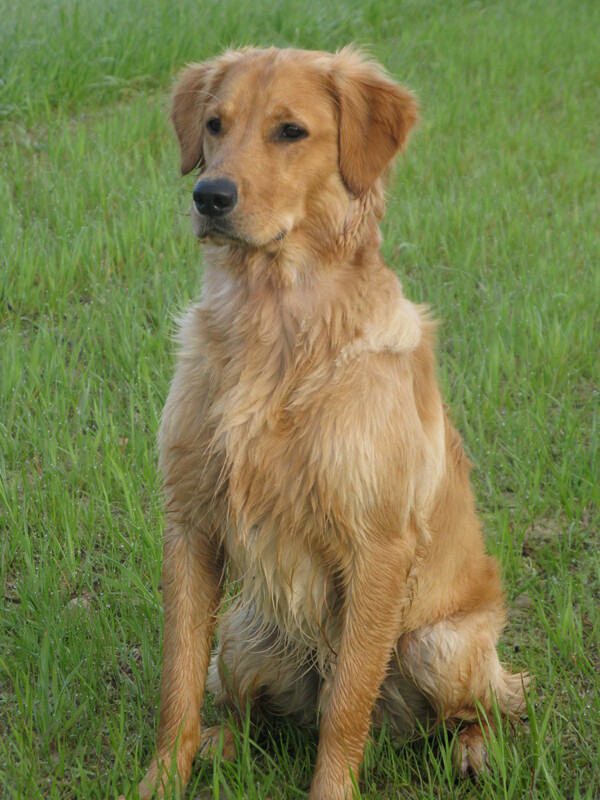 At just over two, this handsome Golden boy is half-way to his Senior Hunter Title. Luke & Alan had some Derby fun early in the year, and then got to work on their SH, earning the first leg at the Sierra Nevada Retriever Club Hunt Test, and the second at the Marin Retriever Club Hunt Test. We’re sure to see some new letters after this Luke’s name in no time. They’ve really done well. Arson & Diane got through Junior so quickly, that they wanted to do it again. It’s unfortunate that one can’t get bonus points for extra legs, because this pair work so beautifully together that we could just keep watching them work. They earned their bonus passes at the Monterey Bay HRC test, the Hills Ferry HRC test, the NorCal Golden Retriever Club Hunt Test & the Lassen Retriever Club test. We’re sure to see them in Senior soon. This baby dog is turning heads. 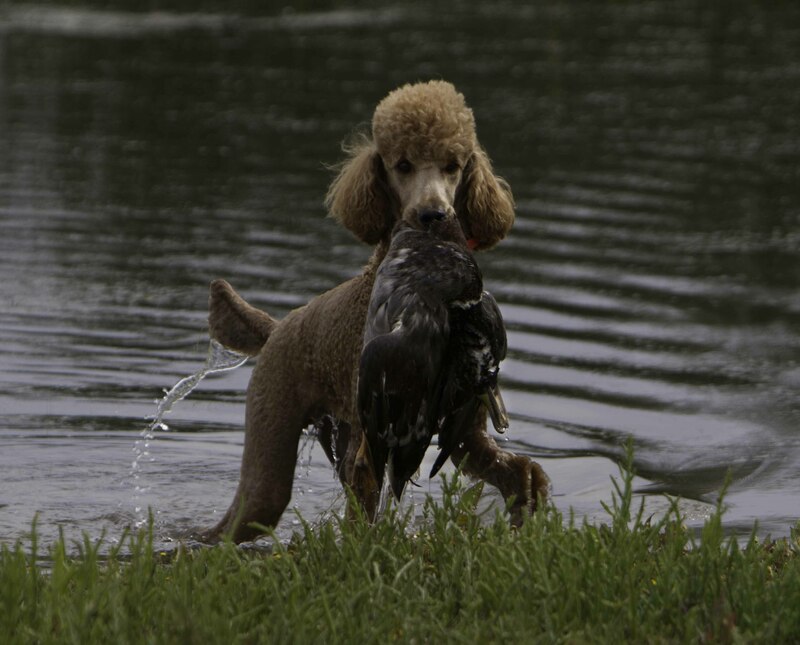 He earned his first Junior Hunter leg at the young age of nine months and one day at the Hills Ferry Hunting Retriever Club’s Hunt Test. Two months later, he earned his second and third legs at the Marin Retriever Club’s double-header. We are certain to see this youngster showing the big dogs how it’s done in Senior in the very near future. Most photos on this post were taken by A. Latta, under a Creative Commons License. Thanks, Xan! Layla completed her Senior Hunter title in two weeks. 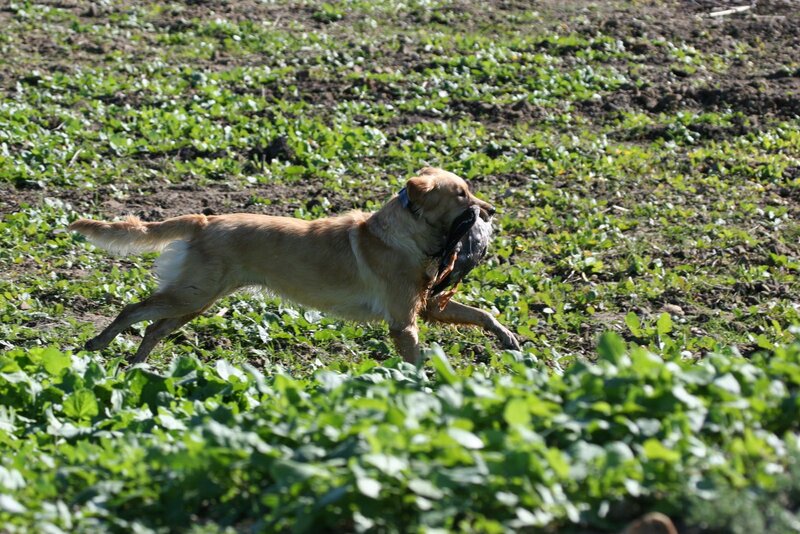 She earned four passes in a row at a pair of double-headers – the Labrador Retriever Club of Southern California Hunt Tests and the Golden Retriever Club of Greater Los Angeles Hunt Tests. Her reliable marking and consistent handling got her through some very difficult tests. Xan & Layla look forward to another epic hunting season as they prepare for Master. 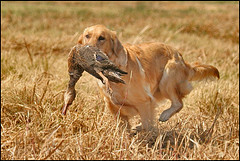 At the young age of ten months, Sugar passed her first JH test at the Sacramento Valley Retriever Club 2008 Fall Hunt Test. Sugar proved to everyone that liver flatcoat puppies can play with the big dogs by earning three more Junior legs in eight days – two legs at the Sagehens Retriever Club 2008 Fall Hunt Test double-header and her fourth and title at the Norcal Golden Retriever Club 2008 Fall Hunt Test. She earned her title at only eleven months of age! Congratulations to Don & Sugar. They plan to celebrate the new title at the local pheasant club. Grace demonstrated that anything worth doing is worth doing efficiently and well. Forced to skip the last tests of the spring because girls in season can’t compete (silly rule! ), Grace finished her Junior Hunter title in style at the Sagehens double header October 4 & 5, earning her fourth and fifth passes. Way to go, girls! We’re looking forward to see you in Senior! Wow! at the young age of eight and a half months, this handsome youngster proved that he understands the hunt-test game and finished his Junior Hunter title. He earned legs in the Redwood Empire Retriever Club 2008 Summer Hunt Test, Sagehens Retriever Club 2008 Fall Hunt Test (a double-header, two passes), and the Norcal Golden Retriever Club Fall Hunt Test. We’re looking forward to seeing this youngster in Senior next fall. Gabby made it clear that she loves being the only gal on the truck. Her two roommates may be awesome mothers, but Gabby benefited from the training time alone with Cheryl. Gabby also likes running October tests. In short order, this dynamic duo earned three Master legs and completed Gabby’s Master Hunter Title. She also passed five of seven Master tests held since August 1, 2008. That means that Gabby has qualified for the Master National! They earned legs at the Sagehens Retriever Club 2008 Fall Hunt Test, the Norcal Golden Retriever Club Fall, and the Labrador Retriever Club of Southern California. What a team! Not to be shown up by Gabby, Flyer completed her Master Hunter Title in grand fashion. These Golden Girls just love October tests! Flyer earned three Master Hunter legs – the first at the Sagehens Retriever Club 2008 Fall Hunt Test, followed by great performances at the Norcal Golden Retriever Club Fall, and the Labrador Retriever Club of Southern California. We expect to see Flyer at the Master National soon! Decker would like to request another fall hunt test. This fall was over way too soon. He just needed one more test to earn his Junior Hunter title. 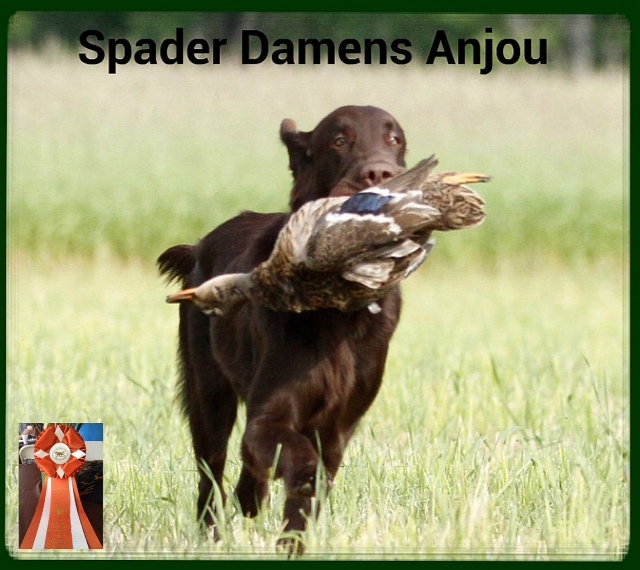 In eight days, this dynamo earned three legs: Two at the Sagehens Retriever Club 2008 Fall Hunt Test double-header and a third at the Norcal Golden Retriever Club Fall Hunt Test. Way to go, Jeanne & Decker! You’ve got to love those brown dogs! In three Junior Hunter tests, Mark & Tule earned three Junior Hunter legs. After taking a break for duck season (where we understand he is performing beautifully), this team plans to return to the hunt test game in the spring for their final Junior leg and the title of Junior Hunter. We look forward to seeing them in February or March! Although they finished their Junior Hunter title in September, Memo and Barb can’t just watch the game. Memo wants her birds. They competed in a Junior test at the Sagehens Retriever Club 2008 Fall Hunt Test on October 5, where Memo picked up her fifth leg. What an awesome team. We’re looking forward to seeing Memo’s baby brother in Junior soon. 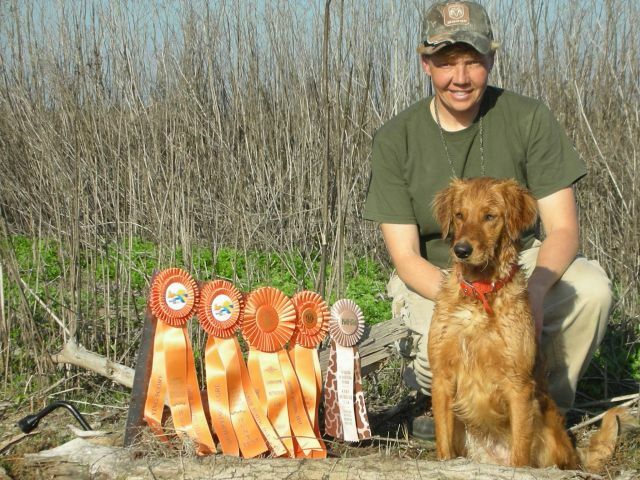 Joe picked up a Junior Hunter leg in October for a total of three, at the Sagehens Retriever Club 2008 Fall Hunt Test on October 5, and his Conformation Championship at the Del Valle Kennel Club Show in October. Pam states that she was ” so disappointed they missed that last leg at the NorCal day, a total handler error, and an expensive lesson! That would have been so cool to title both CH and JH the same month!” We’re sure that Joey didn’t mind. It’s a great excuse to keep working in the field with his favorite person. We’re sure to see Joe with titles on both ends of his name this spring. Sophie and Harvey picked up their third Junior leg at the Norcal Golden Retriever Club Fall Hunt Test. Harvey had a grin that stretched from ear to ear. He’s had to take some time off from training this winter, and we bet that he and Sophie are more than anxious to get back in the fields. They’ve got one more Junior leg to go, and we can’t wait to see Harvey and his talented girl back training soon. Shari & Punch took some time off their upland pheasant training to try out the hunt test game, and they were quite successful, earning their first Junior Hunter leg at the Norcal Golden Retriever Club Fall Hunt Test. Punch will spend the next few months chasing roosters, and we hope to see him back in the hunt test game after pheasant season ends. When we first started working together, McKenzie loved her bumpers. Now she has decided that birds are much cooler. In fact, she LOVES ducks! Gina & McKenzie are nearly there! With limited time in the training field, this team earned three of four Junior Hunter legs in October and November. McKenzie has come a very long way since her introduction to birds in the water, and we expect her fourth leg to come easily. David & Gustav are half-way to their Senior Hunter title! These two are such a joy to watch. This young duo made it look easy, earning their first leg at the Sagehens Retriever Club 2008 Fall Hunt Test on October 4, and a second leg at the Norcal Golden Retriever Club Fall on October 11. David also picked up some great things to work on. We expect this pair to finish their Senior title in short order in the spring. Congratulations to Storm & Cathy on their first Junior Hunter leg! What a nice start for this team, and we expect them to have a promising hunt test career. Storm has learned how to handle birds that stand up and leave the area, and is prepared to deal with difficult terrain and weather challenges. We look forward to watching them in their next JH test. This team is also new to the hunt test game, and they’ve been training diligently. Their hard work paid off with two passes at the Golden Retriever Club of Greater Los Angeles Hunt Test Double header! This was not an easy venue, quite different than the places where they usually train, but they aced both tests, and are now half-way to their Junior Hunter title. We look forward to bragging about their upcoming success and new JH title soon. What can we say about this puppy, except that she’s a carbon copy of her mother Layla, with oodles of energy and drive. 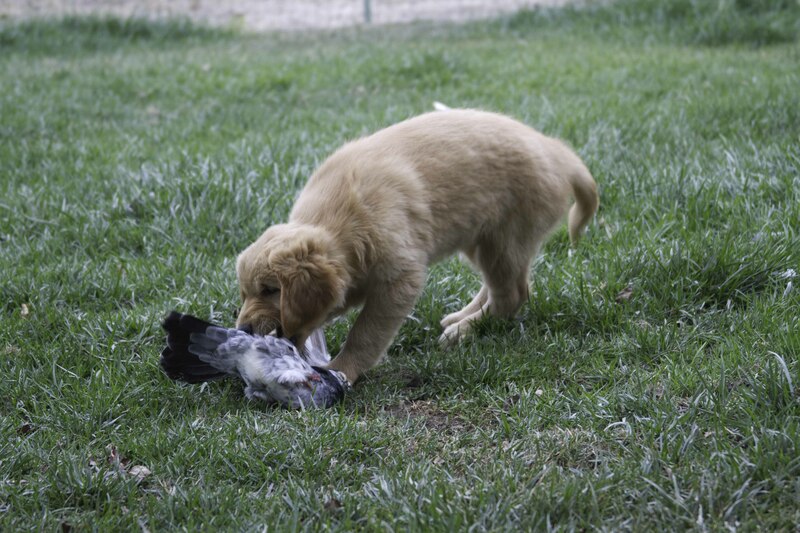 She proved that her young age wasn’t an issue, and successfully completed her first Junior Hunter leg at the Golden Retriever Club of Greater Los Angeles Hunt Test. A grand achievement for an eight-month old flatcoat puppy. She’s currently pushing up birds at the local pheasant club, and training for the spring tests. Zinger and Jean had a productive 2008 fall hunt test season, earning two passes in very difficult tests. Their first MH pass was earned at the Sagehens Retriever Club 2008 Fall Hunt Test, followed the next week by a second pass at the Norcal Golden Retriever Club Fall Hunt Test. Zinger has passed nineteen Master Hunter tests. Two of those legs count toward qualifying for the 2009 Master National. Good luck, girls. We hope to see you there! 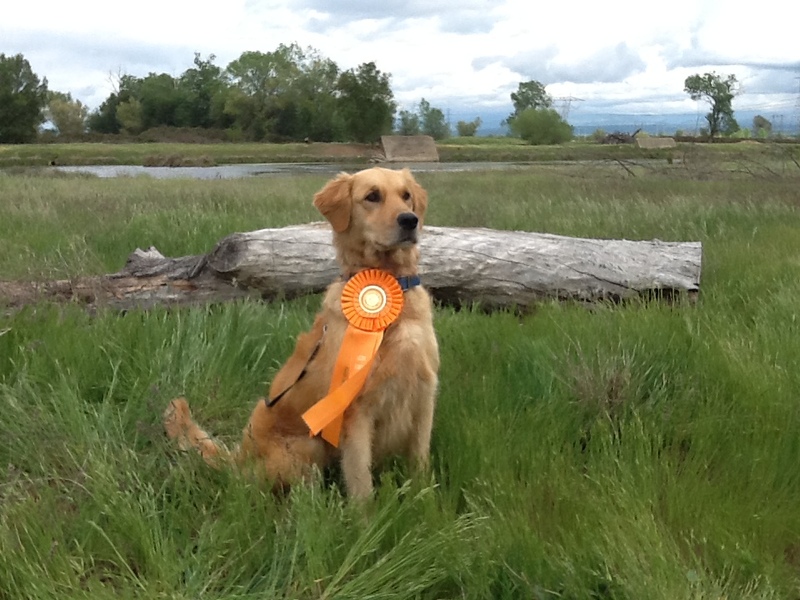 Just two weeks after completing her Junior Hunter title, Ruby earned her Working Certificate at the NorCal Golden Retriever Club’s WC/WCX trial in Suisun City, California. Ruby and Suzanne began hunt training with Cheryl just one year ago, in June of 2007 after earning Ruby’s UDX in Obedience. What an awesome team! Cheryl and Suzanne are going to work toward completing Ruby’s WCX before she officially retires. Born March 13, 2007, Rainbow earned her WC at the NorCal GRC WC/WCX test held at Denverton on June 7, 2008. Bred, owned and handled by Charlotte, Rainbow owes her early successes to Cheryl’s training and coaching Charlotte, and to her mother, Ritzi who whelped 9 pups the day before! Henley qualified for his WCX at the NorCal GRC WC/WCX on June 7, 2008. He qualified for his JH in four out of four tries and his WC on the first try. Although he took two tries to get his WCX, he did so in grand style, proving that Magicgold “men” have the right stuff too. He is a pleasure to train and a wonderful companion. Ardith & Henley are both looking forward to moving on to Senior. Congratulations to this wonderful team! In September, Luke earned his Junior Hunter title at the Sacramento Valley Retriever Club’s 2008 Fall Hunt test at Denverton. Luke is a young work, and his and Alan’s hard work and dedication have really paid off. Luke didn’t put a paw wrong. Now on to Senior and Field trials! This talented team have another title to add to Memo’s impressive collection. 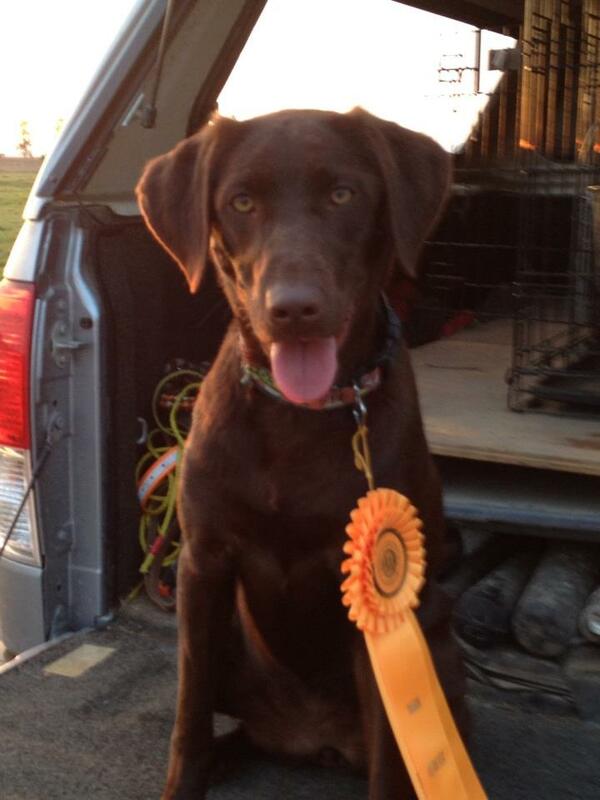 She picked up her final Junior Hunter leg at the Sacramento Valley Retriever Club’s fall hunt test at CRTA Denverton. Memo must be close to earning a spot in the FCRSA’s Hall of Fame! What can’t this team do? Tracey & Cal must LOVE Oregon. In April 2008, they had great success there, earning two JH legs. They travelled to Glide, Oregon again in June, where they competed in the Umpqua Valley Retriever Club double header hunt test. Cal showed his stuff again, finishing his JH title on Saturday, and an insurance leg on Sunday! What a nice weekend! What a wonderful team. 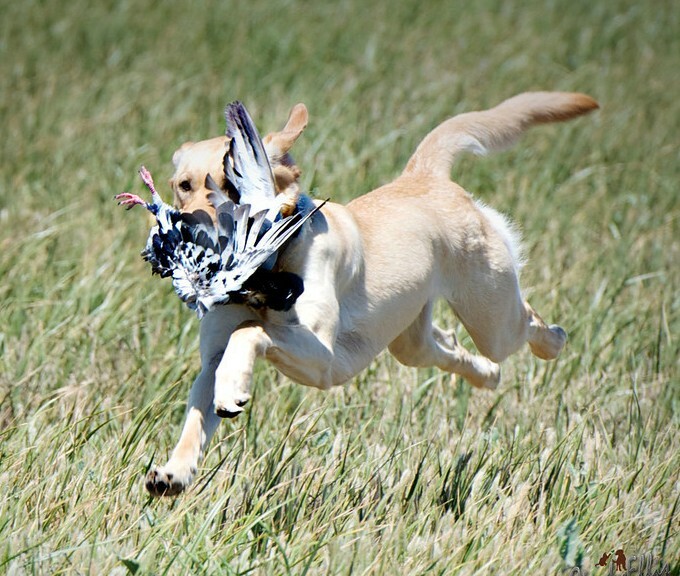 Pam and Joe travelled to Glide, Oregon in June to compete in the Umpqua Valley Retriever Club hunt test. On Saturday, Joe picked up his second Junior Hunter leg — they’re half-way there! Pam & Joey (& Ollie) have worked very hard this year, and it’s a pleasure to see the progress that these two have made. We’re sure that they will pick up their last two JH legs in short order. This team is still turning heads. Shuttle picked up her first Master Hunter leg shortly after she turned two. 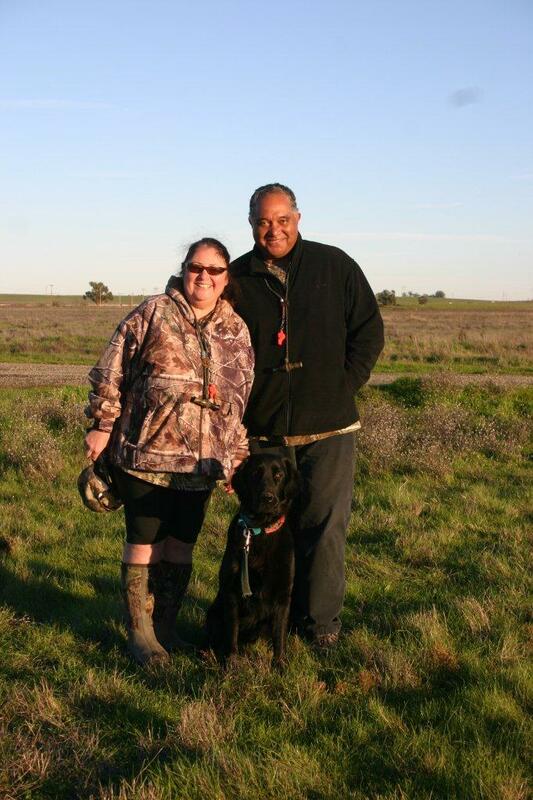 Diane & Shuttle’s fall hunt test season is off to a good start – they picked up Shuttle’s second MH leg at the Sacramento Valley Retriever Club hunt test. Zip(!!!) and Joe earned their second Senior Hunter leg, demonstrating that this team knows how to play the game. Zip(!!! )’s marking continues to earn praise, and their blind work is coming along nicely. Joe also learned what they need to focus on before their next test. The water series was quite a learning experience – first a no-bird when the honoring dog broke, then a duck and pick-up dogs running around trucks and holding blinds, including the one that Joe & and Zip(!!!) were occupying.